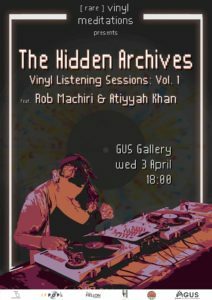 ifPOP, Hidden Years and FUNGUS invites you to a rare vinyl listening session with selectors Atiyyah Khan and Rob Machiri. We’ve asked Atiyyah and Rob to select records from the Hidden Years Music Archive as a way to open the archive to broader listeners. FREE event, no booking required! The evening will start with a conversation about the comeback vinyl records have made in recent years, the process of finding and collecting vinyl, connecting with history through records, and vinyl’s significance in the current digital age. Then, of course, we’ll listen to the grooves.